The St Moritz complex is newly built with high end furnishings and appliances throughout. It is luxurious, inviting and is designed to make you feel at home. It is a place to bring your family and friends to get away and relax. It is quiet, off the main tourist path and has amazing views. You have permitted parking in front and back. You can walk to everything. The condo is fully furnished. It is stocked with 2 rolls of paper towels, coffee filters for a 12 cup drip coffee maker, Kleenex, soaps (dish, dishwasher, and hand), sponge, washer/dryer and laundry soap, cleaning supplies, sheets, blankets, face, hand and bath towels. There is hand soap, lotion and small bottles of shampoo and conditioner, and 3 rolls of toilet paper in each bathroom. Dish soap is in the little metal dispenser attached to the sink, just right of the faucet. Cold filtered water is on the inside left door on the left wall of refrigerator has a gray button. Unit 101 – 1 bed/1 bath, sleeps 5+, queen in the Master bedroom, comfortable leather queen sleeper sofa with memory foam mattress and a full futon, on the1st floor one flight of stairs from the back parking lot, gas grill on the common deck. 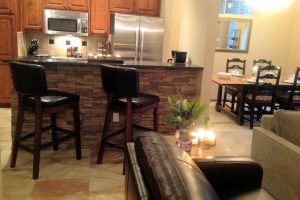 Unit 102 – 1 bed/1 bath, sleeps 5+, King bed master, Comfortable queen and full sleeper sofa’s with memory foam mattresses, 1st floor, one flight of stair from the back parking lot, gas grill on common deck. 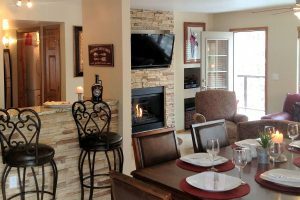 Both Units 101 and 102 are side by side 1st floor, where each condo has its own secured ski and snowboard closet. 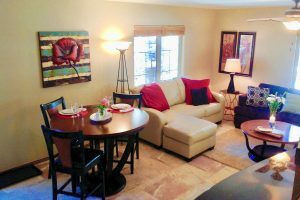 Unit 301 – 2 bed/2 bath, sleeps 5, King in the Master bedroom with a bathroom, 2nd bedroom has a queen bed, hall bathroom, comfortable leather couch NOTa sleeper bedding is provided. 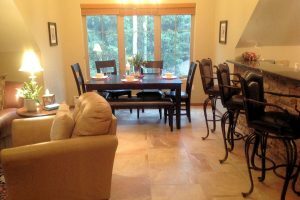 At the tree tops with a wonderful slope-side view, private deck with a gas grill. Located 3rd floor with one flight of stairs up from front parking lot. Unit 302 – 2 bed/2 bath, sleeps 7 in beds, Queen bed in the Master bedroom with a bathroom, 2nd bedroom has a bunk bed with a full bed under a twin bed, hall bathroom, comfortable queen sleeper sofa with a memory foam mattress in the living room, private deck with gas grill. Located on 3rd floor with one flight of stairs from front parking lot. On the roadside with lovely views of the mountain opposite side of valley from the slope ski area. Both Units 301 and 302 are side by side on the 3rd floor and the front door of Unit 402 occupies the same deck. It has spectacular views of the slopes, distant valley views around to the mountain opposite of the ski area. 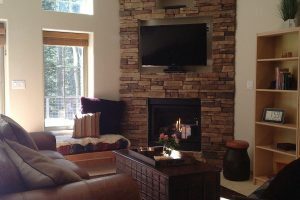 Unit 402 – 1 bed/1 bath, sleeps 4, King bed in Master bedroom, hall bath, a comfortable leather queen sofa sleeper in the living room with a memory foam mattress, private deck with a gas grill, views at the tree tops, views are from the road side looking at the gorgeous views of the mountain opposite of the ski area. It’s located on the top floor(4th level), which is up two flights of stairs from the front parking lot. Black book with tons of information about the condo, local and surrounding areas. Plus a variety of games, books and magazines. For heat there are thermostats on the walls in the living room and bedrooms. Bathroom thermostats are located on the base board heater itself. For cooling open the doors and windows. The living room fireplace is turned on by a switch labeled fireplace to the side. All sofa, sofa sleepers, and spit king bedding is either in the ottomans or in the closets in large plastic containers. Sofa sleepers are made up with clean sheet sets. You will find 2 pillows, 1 blanket and 1 down comforter for each bed. 55 gallon trash and recycle bins are located on this first level in the locker room. We have had bears around this summer, The trash inside of the door. Please don’t leave any food in your car either.